A collaboration between myself and Jonathan Kane. I drew the images, and he created the text, all of the formatting, and the caption below. 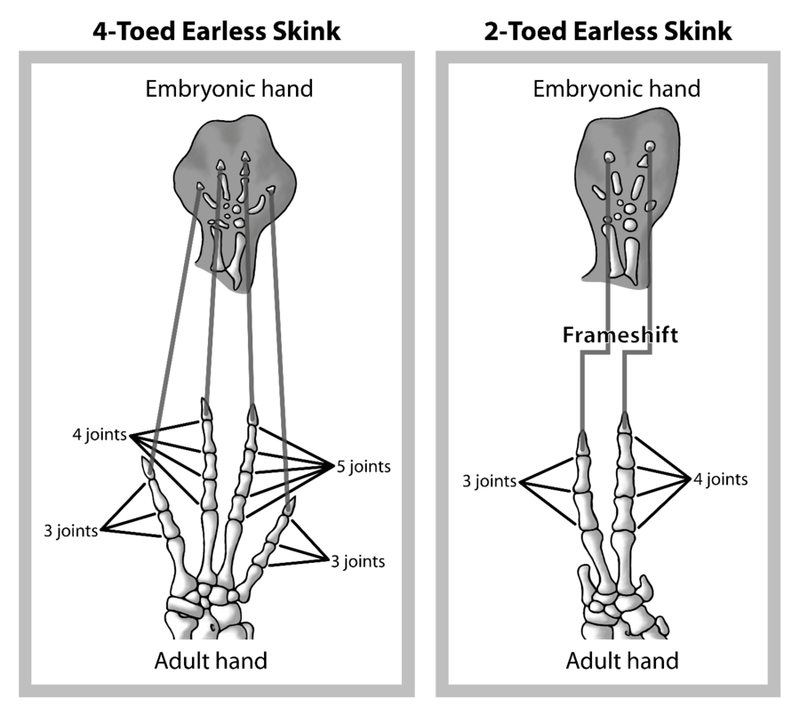 This image relates to an explanation for the reason why theropod dinosaurs appear to have lost their two outermost fingers, but bird embryos form and then lose the inner- and outermost fingers. If birds evolved from dinosaurs, and ontogeny recapitulates phylogeny, then one would expect that the two long-lost fingers that briefly appear in the embryo of a bird to be the same two lost in primitive theropod dinosaurs. However, this is not the case, and this seeming inconsistency has been a common argument of both creationists and BANDits for decades. However, it was eventually established that a digit frameshift is responsible for this exact sort of inconsistency. Of course the genetics of long-extinct theropods cannot be examined, but the same mutation with the same effect has been observed in a number of living organisms, and these skinks are perhaps the best example. *Shapiro, Michael. 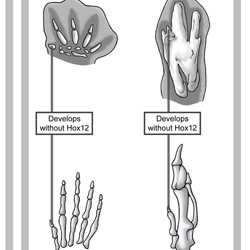 “Developmental Morphology of Limb Reduction in Hemiergis (Squamata: Scinidae) Chondrogenesis, Osteology, and Heterochrony.” Journal of Morphology 254 (2002): 211-231.